Robert Chambers (right) with friend, Ray, about to take off for the UK. We are fortunate in having a stunning set of aerial views taken over Lavendon in 2003 by a former resident of the village, Robert Chambers, who now lives in the United States. In 2003, Robert set off from his home in Connecticut with his friend, Ray, to fly to the UK and, in particular, to see his home village of Lavendon from the air. 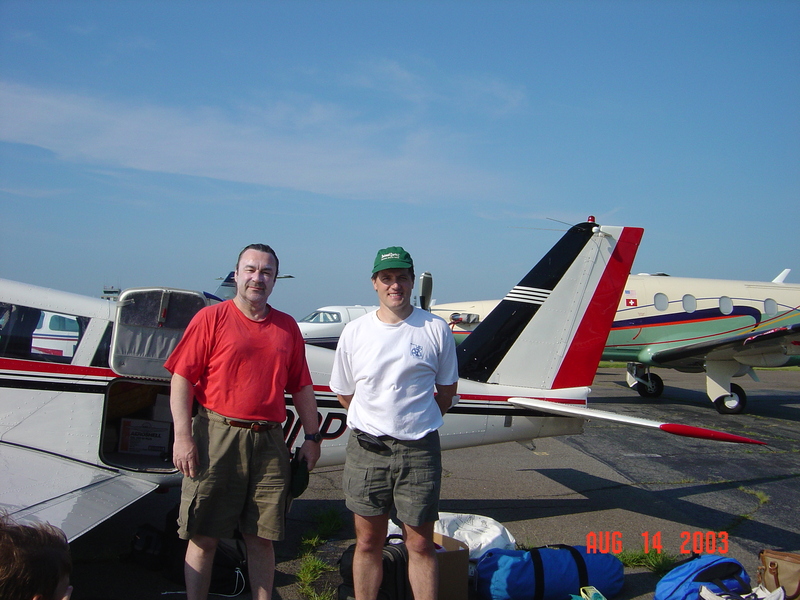 From Connecticut, Robert and Ray flew up to Maine (the Easternmost state) where they fuelled up, and then flew onwards to Goose Bay on the Labrador coast in Canada. They spent the night there and took off early the next morning, flying first to Greenland, where they again refuelled and took off to fly over the ice cap and onwards to Reykjavik, landing there around 11:30pm at night. Robert and Ray spent a couple of nights in Iceland due to the weather conditions, then left there and flew to Wick in Scotland to spend the night there. The next day they arrived at the nearby Cranfield airfield which they used as a home base for their local explorations and to gather the fascinating aerial views of Lavendon, shown below. Olney Road, with the Langlands estate centre right and Jack’s Close centre left. The so-called ‘Way-post’ is top right. Olney Road heading away bottom right, with Longmire and the Horseshoe top centre. Olney Road (left to right) with Tustin’s leather factory, bottom centre, and the Horseshoe bottom right. The view from the village centre towards the Grange and Abbey Farm hidden amongst the trees, near centre, with Northampton Road bottom right and New Row bottom centre. A general view of Lavendon with Olney Road top left and the New Glebe bottom centre. A general view of Lavendon village looking south-westwards towards Olney from Harrold Road (in bottom left hand corner). The centre of the village with Castle Road top centre and Olney Road at the bottom.